History Theatre is a program that engages us with history through the personal stories of people who lived it. Using archival resources such as letters, journals, newspapers, and other reports, Hawaiian Mission Houses develops portrayals of actual figures from Hawai‘i’s history and presents them to the community. This particular program focuses on three people with ties to Hawai‘i Island: Curtis Pi‘ehu I‘aukea (1855—1940), a Waimea boy who grew up to serve the Kingdom, Provisional Government, and Territory; Emma ‘A‘ima Nāwahī (1854—1934), born in Hilo and politically active in the opposition to the overthrow and annexation of the Kingdom; and Simon Peter Kalama (1815—1874), friend and assistant to Dr. Gerrit Judd, renowned local physician and scientist. 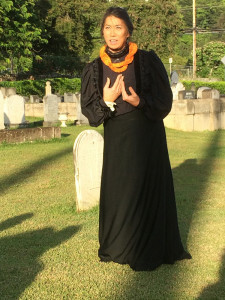 These historical characters and their stories are brought to life by (respectively) Albert Ueligitone, Kahana Ho, and Moses Goods, on two occasions: Monday evening, May 13, and the following afternoon, May 14.